I saw the Ghost of Vince Lombardi, and he was smiling. for the trophy that bears his name. The Packers have won the Super Bowl. Play this music while you read this post. I remember a time when this wasn’t such a big deal, when it was taken for granted that the Packers would win the Super Bowl. 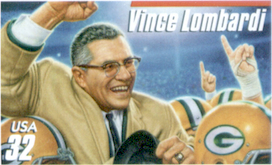 Those were the days when Vince Lombardi was the name of the coach, rather than the name of the trophy. It was a time when watching the Packers was like watching Star Trek: no matter how dire the situation, the Good Guys would always find a way to make Good Things happen. I remember watching the Ice Bowl from the comfort of my parents’ living room. On that day it was called the 1967 NFL Championship Game, and the TV announcers made a big deal about how cold it was. 15 below may have been cold, but for people who could just as well have been snowmobiling or ice fishing, it was no big deal. I remember the odd cheer for the winning touchdown of that legendary game. A cloud rose from the howls of the fans, and the ecstatic joy was filtered by multiple woolen layers. The Packers were going to the Super Bowl. Two weeks later, the Packers won the Super Bowl, and Vince Lombardi was carried off the field on the shoulders of his players. The iconic image of that victory celebration would one day become the most popular postage stamp in Wisconsin history. I spent much of my early adult life living in other parts of the country and paying little attention to football, but I learned two important things while I was away. One was that other teams have OWNERS who jerk their teams around. They hold cities and fans hostage, threatening to move teams somewhere else unless they get a new taxpayer-funded stadium. From columnists on the sports page and from sports-talk radio, there were few kind words for these evil and greedy owners of their favorite teams. This was a new and unfamiliar reality. The Green Bay Packers are the only major professional sports franchise in the US that is a community owned non-profit organization. We have no owners, and no one makes money by investing in the Green Bay Packers. Team executives have only one mission: building a winning team. The other thing I learned was that Packer fans are everywhere. Loyalty to the Green Bay Packers is a permanent and contagious affliction spread by displaced Wisconsinites. In any city in the world, sports bars with screens for every game would have the biggest crowd watching the Packer game. Not long after I returned to Wisconsin in 1993 I made a bold prediction: Within the next five years, the Packers will win a Super Bowl. They only needed four years. While the kids were cheering for Brett Favre and Reggie White, we regaled them with tales from our childhoods of Bart Starr and Ray Nitchke. All was right with the world again, because the Packers had won the Super Bowl. Fourteen years later, a new Packer team for the Ages has arrived. In Aaron Rogers we have a quarterback with the arm of Brett Favre and the discipline of Bart Starr. When guys get hurt, the backups take over and the team moves on as if nothing happened. The offense moves the ball with authority, and the defense sends the other team off the field quickly. This team brought joy and celebration to the frozen north in the coldest time of the year. Young and old, Republicans and Democrats, Libertarians and Greens, evangelicals and atheists, warmongers and pacifists, hunters and animal rights people, white, black, brown, yellow and red are all embracing, high-fiving and united in celebration: The Packers have won the Super Bowl. And they did it with some of their best players on the bench. They did it with backups and rookies. Next year, these young guys will be more experienced, and the injured players will be back. Next year’s team will be better. Expect the Packers to win the Super Bowl again. I’d like to see the Packers winning the Super Bowl over and over again. I want to see Vince Lombardi Avenue lined with Vince Lombardi Trophies. I want the Packers players to run out of fingers for their Super Bowl rings. Am I being greedy? Why would the rest of the country want the Packers to win year after year? It’s because of what we see when any other team wins the Super Bowl: The TV cameras zoom in on a luxury box where the billionaire owner is being congratulated by his invited rich friends. You don’t see that when the Packers win the Super Bowl, because we have no owners. We are the owners. The Green Bay Packers belong to the people of Green Bay, Milwaukee, and the State of Wisconsin. In Wisconsin, you can buy a United States Senate seat, but no one can buy the Green Bay Packers. So let the word go out, from Lake Michigan to the Mississippi River, from Superior to Kenosha, from Eagle River to Platteville, that the torch has been passed to a new generation of Packer players to bring joy to a new generation of Packer fans. It feels great to say it, but get used to it: The Packers have won the Super Bowl. I saw the Ghost of Vince Lombardi, and he was cheering. Musical accompaniment by Butch Vig and the 6 Packers. This entry was posted in Community, Sports & Leisure. Bookmark the permalink. All those calls where part of the fun. We love our Packers.